Bjorngrimsmál (The Lay of Bjorngrim1See Bjorngrim the Dragonslayer, Middarmark, page 36), is perhaps the most widely popular section of the Bjorningsaga2See What Is the Bjorningsaga?, Middarmark, page 39, replete with tales of adventure and desperate stands against terrible monsters. Bjorngrim and his doughty companions journeyed throughout the Middarmark, from the Skera Strait3See Skera Strait, Middarmark, page 21 to the Endless Ice, from the depths of the dvergar kingdom of Nidavellir4See Nidavellir, Middarmark, page 20 and the Gates of Helheim to Fjalar’s very peak5See The Nidfjoll, Middarmark, page 19, and Fjalar, Middarmark, page 20. Skalds throughout parts of the Middarmark ruled by Bjornings regularly recite portions of the Lay to thrill their audiences. While Bjorngrim is widely revered by Bjornings and even some Grælings, they seldom make offerings or sacrifice to him directly. Instead, he tends to be worshipped together with his mother, Sigrun Shieldbreaker, Lady of Battles6See Sigrun Shieldbreaker, Lady of Battles, Middarmark, page 36, or among the multitude of the Lords of Valor. As the patron of monster-hunters, lost causes and heroic last stands, the cult of Bjorngrim the Dragonslayer claims few adherents. Those few tend to be adventurers and other thoroughly disreputable vagrants. Communities in the Middarmark generally despise the cult unless they find themselves beset by a draugr, giant, wyrm or similar foe. While the dwarves do not worship Bjorngrim, many among them respect his memory and his cult. In human lands, only the temple-complex of Jernkloster7See Jernkloster, Middarmark, page 26 boasts a temple to the Dragonslayer. The merchants who brave the Blodveien8See Blodveien, Middarmark, page 17 and depend upon Jernkloster to keep that road clear of monsters are among the few who contribute to the offerings and sacrifices that maintain the shabby temple. Valuables, arms and armor are all prized offerings to Bjorngrim. The heads, teeth, claws, scales or other trophies from defeated monsters are also welcome offerings. Bjorngrim finds sacrifices of wolves, eagles and bears pleasing. The men and women of Jernkloster venerate Bjorngrim highly, but even few of them are dedicated members of his hero cult. Those that are openly affiliated gain a whispered reputation as unstable fanatics. Stories claim that another temple once stood in Nidavellir at the terminus of the Perleveien9See Perleveien, Middarmark, page 20 before the Gates of Helheim. Whether it still stands is anyone’s guess, for no word from the dvergar kingdom has reached the surface in many a year. The cult has little in the way of organization or hierarchy. Status within the cult is informal and determined by deed and boast. Members are expected to give aid and succor to fellow members when possible. Those lucky few born with Bjorngrim as their fylgja receive deference from other members and are expected to achieve great things. The cult has no real political power, though many people believe that High King Stein Sigurdsson, founder of Jernkloster, was a member of the cult. If true, it was not an association maintained by his successors. Shrines to Bjorngrim are usually found in the wilderness, at the site of a heroic deed. Some simply consist of a horgr — a heap of stones piled atop each other. More elaborate shrines feature an image stone that depicts the deed performed at the site. In many cases, one or more horgr are placed around the image stone. Given their placement in remote and often dangerous places, the shrines rarely receive regular upkeep. Visitors may find the stones tumbled, the site overrun with weeds, the paint on image stones faded or the site turned into the lair of a monster or beast. In addition to making offerings or sacrifice, cult members who come across such shrines in the wilds are expected to do what they can to maintain the site before moving on. Many shrines contain relics or other items connected with Bjorngrim that could be used as supplies or gear for prayers. These items might include the hilt of a sword that once shattered in Bjorngrim’s hand, a scale torn from Ofnir’s hide, the still-roving prophetic eye Bjorngrim plucked from the head of Groa the troll seeress and so on. Any member of the Cult of Bjorngrim can initiate new members. Postulants may approach cult members and convince them to initiate the postulant into the mysteries. Devotees of the cult agree that membership requires unusual strength of character (or stubbornness) and will need to be convinced to admit the postulant (generally via a Persuader test or convince conflict). If the cult member is convinced, they will prepare an initiation ritual. Initiation requires the postulant to make a Ritualist Test, Ob 2 (though an Evil GM Factor may be appropriate here). Find a cult member to initiate you into the Mysteries. Persuader test or convince conflict. Perform the initiation ceremony. Ritualist test, Ob 2. Adventuring bands sometimes seek initiation into Bjorngrim’s cult because of a closely held secret: The Rite of Lith10An adventuring band. Closely related to Sigrun’s Hird Rite (used by nobles to form a retinue) and Hlin’s Rite of Ætt (used by kin to form a new clan), the Rite of Lith formally creates a lith, an adventuring band bound to a vættr11A spirit. Pl. vættir that serves as the lith’s spirit guide and protector. The Rite of Lith is only known to the cult’s initiates and it is the cult’s most valuable secret. Only veteran members of the cult know the Rite. Those who do know the Rite are especially suspicious of newcomers seeking to join the cult and difficult to convince. The first step to forming a lith is to seek out a vættr to represent your new family. Animal vættir are the most common: eagles, wolves, bulls and such are popular. Elemental spirits like rock-brothers and the spirits of dead heroes are sometimes called upon as well. The spirit must be approached and convinced to join the band via a convince conflict or riddle conflict. In exchange, the spirit will demand a price: Regular offerings of milk, honey, mead, wine or valuables are common prices, as is the sacrifice of arms or armor to bogs or fire. Sometimes animal sacrifice is requested. The offerings must be made at each of the four seasonal rites12Jolblot, Disablot, Sigrunblot and Haustblot. See Holy Days of the Middarmark, Middarmark, page 37. By default, the spirit will demand offerings worth the equivalent of its Might in cash dice. Coins, gems, jewelry, silverware and plate, objets d’art and rugs and tapestries are worth their value in cash dice. Other items are worth 1D if it takes an Ob 4 or higher Resources test to acquire them, or worth 2D if it takes an Ob 8 or greater Resources test to acquire them. If an item requires an Ob 3 Resources test or less to acquire, it has no cash value as an offering. However, the price may be modified by the level of compromise in the convince conflict. If the players convince the spirit to join the lith with no compromise, they may reduce the price to appropriate items with no cash value. The players convince the wolf spirit Hrothvitnir to be the vættr of their lith. The players won the conflict with no compromise. Hrothvitnir’s Might is 4, so normally the players would have to make a seasonal offering worth 4D of cash to keep Hrothvitnir fed. 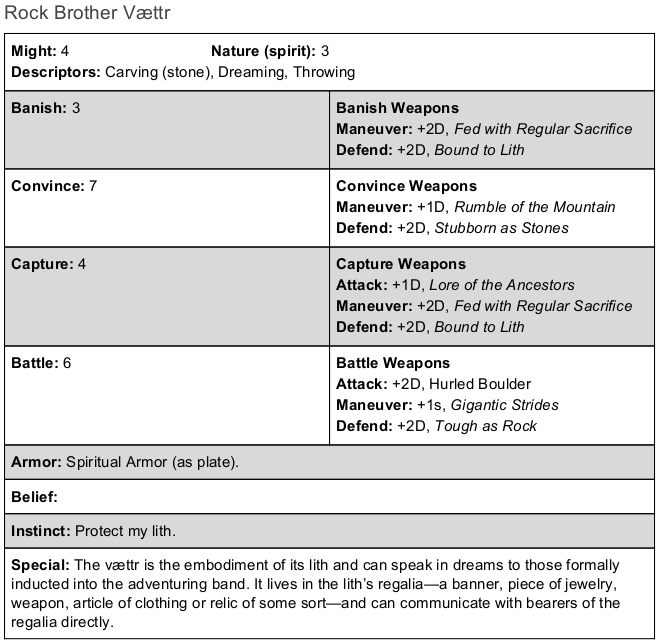 Since the players won with no compromise, they may instead offer four items that have no cash value: Perhaps two swords taken from vanquished foes, a splintered shield and a jug of wine. The spirit will not be pleased with useless trash. The items should be appropriate to a warlike and heroic being. An animal sacrifice may also replace 1D worth of value. In this case, the blood from the animal is collected by the officiant and sprinkled on the participants, then the meat is boiled and eaten by the participants. If the players win the convince conflict with a major compromise, they may reduce the price by 3D (to be replaced with appropriate items with no cash value). If the players win with a compromise, they may reduce the price by 2D (to be replaced with appropriate items with no cash value). If the players win with a minor compromise, they may reduce the price by 1D (to be replaced with appropriate items with no cash value). If the spirit wins the convince conflict with no compromise, it refuses to join the lith. If the spirit wins with a compromise, the GM may either choose to have the spirit join the lith but raise its price by the level of compromise (1D for major compromise, 2D for compromise, 3D for minor compromise) or have the spirit set the players a quest or task to prove their valor. The difficulty of the task should be commensurate with the level of compromise. Find a spirit to be the vættr of your lith. Convince it to join via a convince conflict. 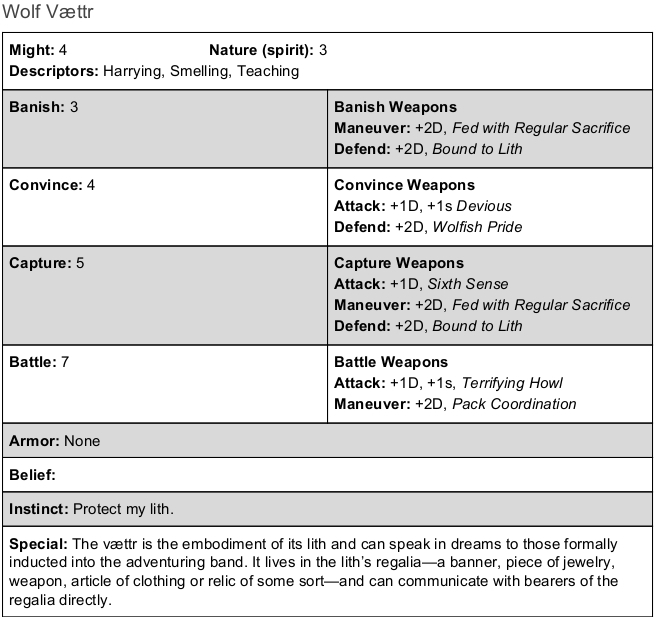 By default, vættir will demand the lith make seasonal sacrifices with a value equivalent to their Might in cash dice. The price may be modified according to the level of compromise in the convince conflict. The band must agree to make the appropriate offerings and/or sacrifices at each of the seasonal rites to keep the vættr happy. Offerings or sacrifice to the vættr requires a Ritualist test with an obstacle equal to the spirit’s Might. Failure taxes the spirit’s Nature by 1. Meeting the obstacle keeps the spirit fed and empowered. If the spirit’s Nature is taxed, meeting the obstacle restores 1 point of tax. Margin of success restores additional points of taxed Nature on a one-for-one basis. If the spirit’s Nature is taxed to zero, the spirit is destroyed and the lith dissolves. At each of the seasonal blots, the lith must make a sacrifice to its vættr. Making the sacrifice requires a Ritualist test with an obstacle equal to the spirit’s Might. Failure in the Ritualist test taxes the spirit’s Nature by 1. If the spirit’s Nature is taxed to zero, the spirit is destroyed and the lith dissolves. Meeting the Ritualist obstacle restores 1 point of taxed Nature. Additional points may be restored by the margin of success on a one-for-one basis. The Rite of Lith must be performed at one of Bjorngrim’s shrines. The founding members of the lith must each present an item that will serve as their connection to the vættr and provide a physical home for the spirit. Weapons, armor, jewelry, fine tools, the masthead of a ship, and similar items are frequently used. These items form the lith’s regalia. The loss or destruction of a piece of the lith’s regalia taxes the spirit’s Might by 1 for each item lost or destroyed. Lost items may be recovered. Consecrating a new item to replace one that was destroyed requires an epic quest. Recovering or replacing the item restores the taxed Might. As each member in turn presents their item, they pronounce the goal of their new adventuring band. The goal might simply be to attain wealth and fame, or it could be to perform some great deed or right some terrible wrong. Whatever the goal, the vættr will take it up as its own and dedicate the lith to that goal until the lith is destroyed or it accomplishes that goal and dissolves. 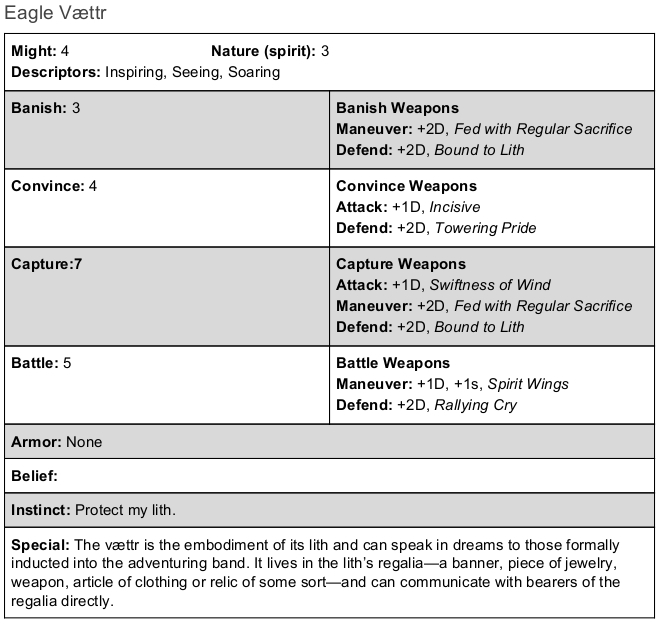 The GM should write an appropriate belief for the vættr. Each founding member presents an item that will serve as part of the vættr’s regalia. Loss or destruction of a piece of the vættr’s regalia taxes the vættr’s Might by 1. Lost items may be recovered. Destroyed items can be replaced with an epic quest. Recovering the regalia or replacing it restores the vættr’s taxed Might. While binding the vættr, the new members of the lith state the goal of their band. That goal becomes the vættr’s goal. The leader of the rite must then perform a sacrifice to cement the pact, sprinkling the blood on the members, their items and on the shrine’s horgr. Making the pact requires a Ritualist test, Ob 4. Conditions like Afraid, Injured or Sick are appropriate consequences for failure. Twists should be suitably weird or dire. Look to the Magic Twists and Prayer Twists in Torchbearer13See Magic Twists and Prayer Twists, Torchbearer, page 130 for inspiration if you need it. Each Winter14See Winter, Torchbearer, page 101, so long as the lith continues to exist, the vættr increases Nature by 1, to a maximum of Nature 6. When the first member of the lith reaches level 7, the vættr’s Might increases to 5. 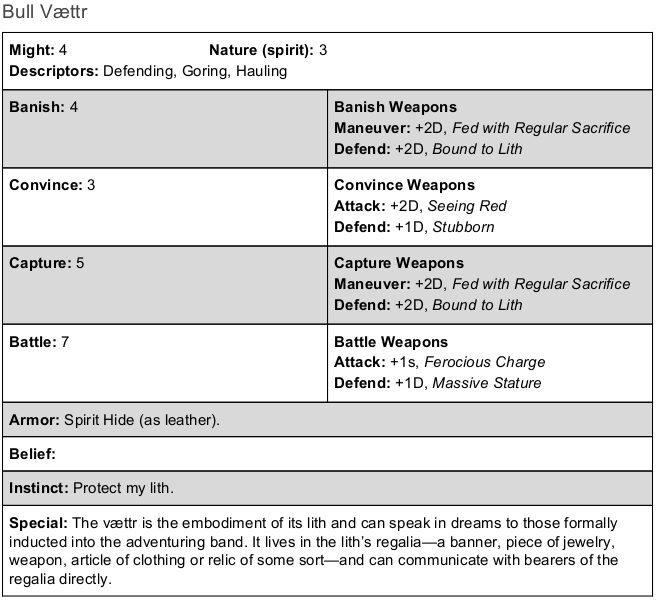 When the first member of the lith reaches level 10, the vættr’s Might increases to 6. Any member of the lith may use a piece of the vættr’s regalia in a ritual (Ritualist, Ob 3) to connect with it. When so connected, the vættr can speak to that character in furtherance of its belief, goal or instinct. Likewise, it can provide help to characters that have performed the ritual, so long as they remain in contact with the regalia. It can only help within the context of its nature descriptors and if its belief, goal or instinct applies. Binding the vættr requires a sacrifice. Ritualist, Ob 4. Each Winter, the vættr’s Nature increases by 1, to a maximum of Nature 6. When a member of the lith reaches level 7, the vættr’s Might increases to 5. When a member reaches level 10, the vættr’s Might increases to 6. A member of the lith who is touching an item of the vættr’s regalia may connect to the vættr with a Ritualist test, Ob 3. When connected, the vættr can speak to the character or provide help to the character with in the context of its Nature descriptors, so long as its belief, goal or instinct applies. This entry was posted in Middarmark, Monsters, Playtest and tagged Immortals, Spirits by Thor Olavsrud. Bookmark the permalink. I really love these rules, and I think these also are probably the most directly portable from the Middarkmark stuff so far in terms of bringing it over into vanilla Torchbearer. While obviously a lot of the flavor and mechanics are tied into the Middarmark setting, there could just as easily be these types of shrines and spirits in a different setting. There looks to be a lot of inspiration here to be able to make cults in general a larger focus of a Torchbearer campaign. In terms of the mechanics themselves, I especially like the idea that the vættr dissolves once its goal has been accomplished. I think this in particular can lead to a lot of researching of shrine locations by the party to try and treat with vættr for specific purposes. 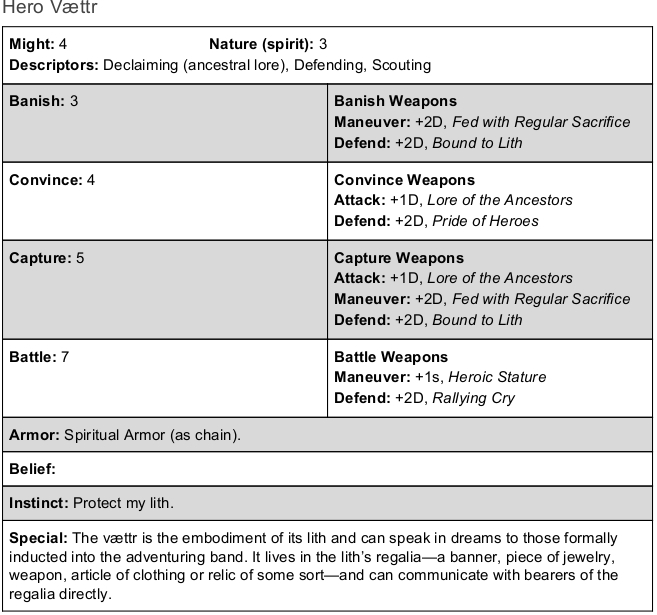 Based on what the party is trying to accomplish at the time, some vættr could definitely prove more valuable than others, which could easily change as the campaign moves along. Thanks! And yeah, I dig that too. I can also imagine lith with long-term goals in which the adventuring band outlives the original founders. You’d have to work your way up through the ranks to earn the right to carry a piece of the band’s regalia.